Systemic Risk - What Does It Mean? What is systemic risk? What is the definition of systemic risk? You very likely first heard the term "systemic risk" during the economic meltdown of the summer/fall of 2008. "Systemic risk" is a term that brings chills to even the most hardened of economists. 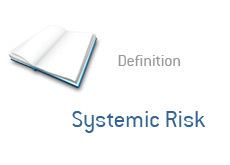 "Systemic risk" refers to the risk of collapse for an entire financial system or market. "Systemic risk" refers to the interconnectedness of the entire economy or of an entire market segment. If one or two companies fail in a market or economy, then the entire system can collapse, due to the interconnectedness of the system. This is also referred to as "cascading failure", meaning that a contagion at one firm can quick spread to an entire market or economy. We saw this during the financial collapse of 2008. There was "systemic risk" due to the interconnectedness of companies such as JP Morgan, Goldman Sachs, etc. The failure of Lehman Brothers led to the near-failure (without government intervention) of many different companies, which nearly led to the collapse of the entire economy. General Electric and Goldman Sachs were just a few of the companies that were at risk of going under during the darkest days of the financial meltdown.